Tikis, relics, talismans, lucky charms, omens or just a personal ritual to hedge your bets against bad fortune; they all are symbolic footholds in a chaotic unpredictable existence. The earliest temple yet discovered is Göbekli Tepe which is located in modern day Turkey. The in situ finds date the temple to it's earliest construction stage at 9000 BC. Preliminary evidence points to a codification of ritualized superstition in the form of animism as seen on the menacing statues of adorning many of the pillars found at the site. The people who built the temple complex were seemingly erecting a sacred area in which rituals could be preformed. Try envisioning the temple as a place where rituals were carried out as a “insurance policy” against possible malevolent supernatural forces which they were otherwise unable to abate or avoid. Both the animal paleozoological and paleobotanical finds at Göbekli Tepe indicate that the architects of this temple complex were still heavily dependent on hunting and gathering and not a fully developed sedentary farming society. The standard theories of the development of religion state that a stratified and complex religion (e.g. religious hierarchy) would not exist before a society adopted the technological fundamentals of neolithic revolution into their culture. Klaus Schmidt, the principle archeologist studying Göbekli Tepe, has said about the temple; "First came the temple, then the city". In other words, superstition came before religion. Several millenniums later these aspects of superstition along with technological and cultural traditions spread out over the Eurasian plate by peoples emanating from the edge of Fertile Crescent. The fertile crescent a.k.a the “bread basket of the world” or the “cradle of civilization” is seen by the archeological evidence to be the epicenter of the neolithic revolution which was can be viewed as the birth of the modern era. There were peoples who, like in the case of those who built Göbekli Tepe, were influenced by the advancements of the neolithic revolution but who didn't adopt the sedentary lifestyle needed to evolve into a complex and hierarchal society; i.e cities. This rudimentary process of influence from one culture to another is called diffusion. Diffusion is basically the transference of a cultural “artifact” from it's place of origin to another place. This process is manifested in such exchanges involving population migrations, trade, war or diplomatic contact. Often diffusion has an undertone of conquest as denoted by technological dominance. This anthropological theory has been altered and refined to become what it now deemed acculturation. Acculturation encompasses, therefore, the same mechanisms for adoption of new cultural traits from a dominant society interacting with a subordinate culture but with out an a priori malevolent intent. One such group on the fringes of the neolithic European landscape was the ubiquitous but disparate category of people known collectively as the Celts. Celtic European occupancy traces back more than 2500 years and spans a territory from Eastern Europe, Greece, Spain, Northern Italy, Western Europe, England, Wales, Scotland and Ireland. The Celts are considered to be the first major Indo-European peoples to spread across all of Europe. They apparently migrated begrudgingly due to pressures from other Indo-European groups such as the Germanic, Greek and Latin peoples. The Celts were a pre-literate society whose culture was preserved mainly through oral tradition. The sparse written accounts of the Celts are those of classical authors; chiefly the Greeks and Romans. Accordingly, due to the late pacification and ensuing subjugation of Ireland and Scotland as well as other pockets of recalcitrant “pagans” in Europe, some vestiges of ancient celtic traditions in the form of superstition persisted. Some of those superstitions are so ingrained in our lives we neglect to realize the origin and meaning of the superstition. Here is a list of 5 Celtic Superstitions that have been with us for thousands of years and don't seem to be going away anytime soon. So, if the languid state of current world affairs has you in a pragmatic conundrum my advice would be to follow the Celt's lead. The precise origins are obscured by history, yet there is archeological evidence to suggest that the practice of offering up money to water dates back to the period of the Roman occupation of Britain. The county of Northumberland is home to the Coventina Well where thousands of coins have been excavated. The minting dates on the coins range from the first through the fifth century AD. Due to the fact that the Coventina Well was discovered amidst apparent temple ruins the conclusion archeologists have drawn is that the offerings were made as part of a religious observance. The superstition that ones soul could be absconded with by nefarious supernatural forces if ones reflection was seen in water predates the mirror. Accessing the original time frame of this superstition is almost impossible. Logic dictates that the superstition of a broken mirror's shards ensnaring the soul and the harbinger of bad luck is probably just a continuation of the aforementioned older superstition. The arbitrary length of time before the misfortunes are lifted comes from the Romans belief that seven years are needed for life to regenerate. This one is a superstition wrapped in a superstition. There are diverse explanations as to why touching or knocking wood developed into a superstition. The explanation which conforms to possible Celtic influence is the one discussed here. Celtic mythology held that faeries, pixies, brownies and other woodland little people used trees as their homes. Presumably, by knocking on the bark of a tree would awaken the slumbering faerie folk allowing them to hear your plea for a good favor. Simultaneously the knocking prevented the more malevolent and evil spirits of the woods from eavesdropping on your plea to the faeries and potentially sabotage it. The modern variation of touching or knocking wood to stave off ill fortune may have been adapted by the early Christians from the Celts. The early Christians attributed wood to being a symbol of the Cross on which one of their primary deities was sacrificed. Touching the Cross would imbue them through transference with the protection of their god. Although the origins may be traced to the Celtic (Druid) priests throughout Europe, the survival of this superstition is chiefly due to its prevalence in modern Irish folklore. The scarcity of four leaf clovers contributed to their mystical quality among the Druids. The clovers were a viewed as tools to pry open the esoteric third-eye which allowed the Druid to initiate contact with the spirit world. Once in the spirit realm the Druid was able to consult the deities as a shaman on behalf of his people. 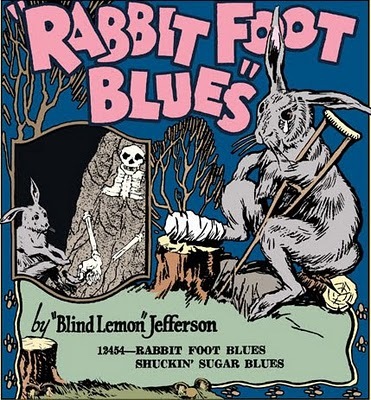 Possessing a rabbit's foot talisman is so deeply engrained in Indo-European culture that assigning an origin to the superstition quickly becomes a fools errand. It is believed by some mythology scholars to have been practiced by Celts several thousand of years ago. This is only conjecture based on the Celtic belief that the rabbit or hare spent so much time underground allowing for more frequent contact with the underworld. Another explanation would be their association with fertility and rebirth. The Christian holy day of Easter has its roots planted in the ancient Celtic celebration of the birth of Spring. Rabbits, hares, chicks and eggs are all part of the rebirth symbolism connected to Spring and Easter. Furthermore, structural anthropologists deem the hare or rabbit as embodying a duality of good and bad which manifests itself in origin stories centered around twins. Claude Levi-Strauss, the late proponent of Structural Anthropology, states that the rabbit represents the twins because of its mouth being equally split down the middle: harelips. The twins in mythology emerging from the hare's mouth embark on different adventures one good and one bad. To possess the good (right) foot and to dismiss the bad (left) foot of a rabbit would garner the owner with symbolic power over the evil twin.